Early Evidence: Fort Hood Gunman Showed No Warning Signs : The Two-Way The soldier who has been identified as the man who killed three people and wounded 16 before apparently taking his own life Wednesday was an Army truck driver who was being treated for depression. SPC Ivan Lopez is pictured in the Sinai Peninsula between 2007 and 2008 during his service with the 295th Infantry of the Puerto Rico National Guard in this undated handout photo. 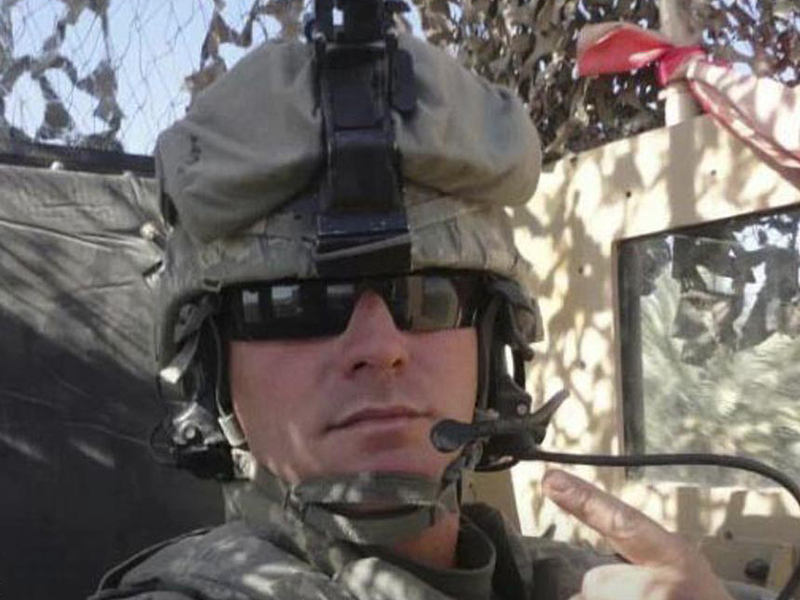 A picture is beginning to emerge of 34-year-old Army Spc. Ivan Lopez, who officials have said is the man who opened fire Wednesday at Fort Hood and killed at least three people and wounded another 16 before taking his own life. The early signs indicate that while Lopez was being treated for depression or some other type of mental issue, he had shown no sign he might be a threat to either himself or others. NPR's Marisa Peñaloza spoke to the Mayor of Guayanilla Edgardo Arlequin Velez. Lopez grew up in Guayanilla, Puerto Rico, and Velez was his music teacher through high school. He described Velez as "a great human being." "He was a very good student, obedient disciplined and talented," Velez said. He said Lopez played percussion in the band; he married early and worked for the police department before joining the military. Lopez, Velez said, had two kids with his first wife in Puerto Rico and two kids with a second woman in Texas. The last time Velez saw Lopez was at the funeral of his mother in November of 2013. Velez said he saw nothing that could have led Lopez to go on a shooting rampage. "He was in Iraq and it's obvious when these young people join the military they live through things that sometimes transform their conduct," Velez said. "They end up damaged. I imagine something similar must've happened to Ivan." The Los Angeles Times reports that Lopez bought the .45-caliber Smith & Wesson semi-automatic pistol from Guns Galore LLC in Killeen. That is the same store that sold Maj. Nidal Malik Hasan, who killed 13 people and wounded 30 at Fort Hood in 2009, the FN 5-7 pistol he used in the assault. "He was seen just last month by a psychiatrist," Army Secretary John McHugh said this morning of the gunman. "He was fully examined and as of this morning we had no indication [from] the record of that examination that there was any sign of likely violence either to himself or to others." McHugh was testifying, as we reported earlier, at a previously scheduled Senate hearing. The gunman "had a clean record" in the military, and background checks of him "show no involvement with extremist organizations of any kind," Secretary of the Army John McHugh just said at the top of a previously scheduled Senate hearing. McHugh also told the lawmakers that the soldier had been prescribed multiple prescription drugs, including a sleep aid. Gen. Ray Odierno, the Army's chief of staff, said the gunman had been in the Puerto Rico National Guard for nine years before joining the U.S. Army. The Associated Press adds that "Lopez was from the U.S. territory of Puerto Rico and joined the island's National Guard in 1999. He went on a peace and security mission to Egypt's Sinai Peninsula in the mid-2000s, and left the National Guard in 2010 to join the U.S. Army, said Lt. Col. Ruth Diaz, spokeswoman for the Puerto Rico National Guard." -- On Morning Edition, NPR's Tom Bowman said Lopez was "a military truck driver ... married with a family" and that he had been assigned to Fort Hood in February. According to Fort Hood's commander, Lt. Gen. Mark A. Milley, the gunman (whom Milley did not name) was being treated for depression and anxiety before Wednesday's incident. There's no record that Lopez was wounded during a 2011 tour in Iraq, NPR's Tom Bowman said, but the soldier had "self-reported a traumatic brain injury" — possibly a sign that he had suffered a concussion at some point. -- USA Today says "Lopez arrived at the installation in February from another Army post and had not been assigned to one of the Army Wounded Transition Units, military units that are set up to care for wounded, injured or ill soldiers. Those assigned to these units have case managers who help them track appointments and manage their medical treatments." -- The Dallas Morning News writes that Lopez served in Iraq for four months. "Police spent Wednesday night searching his apartment in nearby Killeen," the newspaper adds. -- Lt. Gen. Milley told reporters Wednesday "that the .45-caliber Smith and Wesson handgun used in the shooting was recently purchased locally, and that the suspect was not authorized to carry a concealed weapon," Stars and Stripes writes. -- The gunman "was in uniform at the time of the shooting," according to KWTX-TV in Waco.